1 IN 3 WOMEN WILL EXPERIENCE DOMESTIC VIOLENCE, SEXUAL ASSAULT OR STALKING FROM AN INTIMATE PARTNER, AND 1 IN 6 MEN WILL BE SEXUALLY ABUSED. THESE ARE YOUR SISTERS, BROTHERS, CHILDREN AND FRIENDS. NO MORE is a unifying public awareness and engagement campaign focused on ending domestic violence and sexual assault. Using its signature blue symbol to increase visibility and foster greater dialogue, NO MORE seeks to break social stigma, normalize the conversation around domestic violence and sexual assault, and increase resources to address these urgent issues. 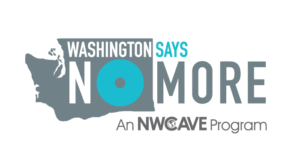 NO MORE is aligned with hundreds of organizations working at the local, state and national levels on prevention, advocacy, and services for survivors and NWCAVE is honored to be a partnered organization for Washington State. Our National Anti-Violence Conference, the No More Summit, takes place in March in odd years. Join us for the NO MORE Summit in 2021, until then stay informed about the summit and see our photos from past years at website.